Alfonso Benvenuto is all smiles, obviously a happy president, even if the AEHT financial accounts have made him lose some sleep. So he’s been president for a year – what does he have to say about this first year? First of all I should like to say that here in Bled we have had an amazing welcome. I find everything pretty well perfect in this little Slovenian town, which is very well organised for tourism. And of course you have to find room for more than 600 people! And I am doubly pleased because Bled students have taken part in all these competitions which have been organised as part of this Annual Conference. In fact, at various levels, the whole school has participated, and this is the purpose of the Conference, not only for the students, but also for the students together with the teachers – to meet and exchange ideas – that is the strength of the AEHT. I should add that the seminars which have been arranged this year have been really superb. I’m thinking of the one organised by Michel Gaillot with Georges Asseraf about the European ‘common skills inventory’ BTS, and the one run by Gilles Honegger from the ACCOR group. These events have made me satisfied. And the thought of all the young students who have been able to go abroad thanks to Marco Otten of CENET. Over my first year as president I should also say that the Presidium and the Executive Board have also worked well. And, as I said at the General Assembly, each national representative should be, or should become, ‘the long arm of the AEHT in his or her country …’. National representatives should contact all the schools, take part in exchanges and competitions and be in touch with the Presidium, and make appropriate proposals. The AEHT must be even more active in every area. The schools are most important for the future: good hospitality, good service and professionalism are tantamount to good business. Our schools represent the financial success of each of our countries. But it is up to each country to ensure that their hotel and tourism schools perform well, and to this end they need to be given the appropriate means. Year after year the various activities have been refined so as to minimise the possibility of any slippage or discontent. This is the case with the competitions which have often been a cause for complaints – sometimes justified, sometimes not. Now the AEHT has set up a CAT - Competition Assistance Team. Its ‘boss’ is Louis Robert, former president and now vice-president. In the bus on the road between Bled and Ljubljana, he gave me his views on the subject. ‘ This CAT was set up almost a year ago in Senigallia, as a consequence of all the problems which had arisen in this or that area of the competitions. Until then there were no precise rules. This time, the CAT is there. It is made up of four specialists who are used to competitions - Anne Dearey (Ireland), Romana Bauer (Austria), Helena Cvikl (Slovenia) and Asdis Vatnsdal (Iceland). And there is myself, the person responsible for this CAT. The competition rules were drawn up, and applied here in Bled for the first time. From now on the rules will be applied to all AEHT competitions. Generally speaking I would say that it went well and that the rules were applied, although obviously some tweaking will be necessary. The objective of rules such as these is to place all the competitors on an equal footing, to give them all an equal chance right from the start. An example of this is the use of the ‘single basket of ingredients’ which all competitors must use. Another thing: the composition of the teams, which is now decided by drawing lots in public so that there is no unfairness or favouritism. And the rule that all communication must take place in one of the AEHT’s two official languages. This is important in that it helps to avoid situations which may lead to incidents. In France he is ‘General Inspector of Administration for the French Ministry of Education and Research’; in Bled he led the seminar on the International ‘Common Skills Inventory’ BTS for Accommodation Managers – his own baby, you could add. He is an economist, holds the ‘agrégation’ QTS qualification and has taught in schools then in universities; he is a researcher, a civil servant in the Ministry of Finance, a company boss, who also worked for a while in the European Affairs department of the Prime Minister’s office. Georges Asseraf describes himself as a ‘rare bird’, and this man of just over 50 is one of those who, having enjoyed a non-standard career, love working in the field. How did you have the idea of this BTS qualification? I worked with around a hundred experts at around fifteen seminars. The fact is that I am a consensus builder, I identify what are the common driving forces, and off we go! So the ‘building site’ is well advanced. But I would be very surprised if you did not have other buildings under construction? Of course. It is not enough just to create qualifications and training schemes – you must then work out how to apply them, how to implement them; you need to be able to locate existing resources, be able to respond to the needs of business, don’t you? Marc-Etienne Gartmann, the only Swiss representative, is the deputy director and head of the Higher Education department of the Swiss School of Tourism and Hospitality located in Passugg near to Chur. The school has 750 students of 50 different nationalities. In his own department there are 220 full-time students and 110 during the placement periods. Why did he come to Bled? ‘Our school has been a member of the AEHT for several years, but no-one has ever represented us at the Annual Conference. I have come to Bled to see what is going on, and to do some networking. To be honest, I didn’t think that this conference was such a large operation and had so many participants.. But I have noticed that the students here are for the most part younger than those in our school: ours are aged between 20 and 25, and they all have higher qualifications than the professional baccalaureate, though we also train people who have just completed an apprenticeship. However I think that we could come to the Conference with students from the other department where the students are younger. We’ll have to see. How do Swiss schools operate? Marco Otten is the director of CENET (Cultural Exchange Network – www.cenet.us), a not-for-profit foundation whose remit is to place students in American hotels and restaurants for periods of between 12 and 18 months. Marco is a regular at the AEHT Conference for a very good reason – this is his recruiting ground where he can find future partners. A few hours before their return to Vilnius (Lithuania) Biruté Stasiuniené and Jonas Kietavicius are still enjoying the unalloyed pleasures of the gala dinner in the Bled sports hall/ice-rink which has been turned into a banqueting hall for the occasion. They are Director and Director of Studies respectively of the Vilnius Hotel and Commerce School, which has more than 1,100 students, and they seem very pleased to be here. There is a good reason for this – they are the very latest members to be recruited by the AEHT. What are you expectations of the AEHT and the Annual Conference? ‘We hope to develop relations with other European countries, and to arrange exchanges with other pupils and students. We have become members of the fine European family of schools. It is marvellous. And it will help us to form relations with other schools, both between teachers and with students! In 1995 a young chef from Thionville, France, set up shop near to the city hall of Ljubljana. There he opened a magnificent gastronomic restaurant with a now well-established reputation. Now aged 37, Eric Raucher is the only person in the gastronomy business in the Slovenian capital – and he is a Frenchman. 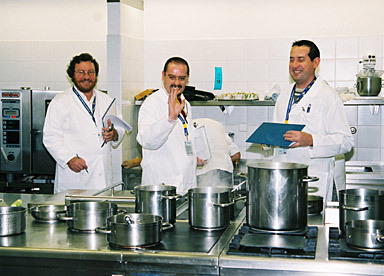 He was very glad to accept the invitation to be member of the judging panel for the cookery competition during the Conference. What were his impressions? Since this was spoken by a chef who clearly knows what he is talking about, there is obviously work to do to raise the standards.